Find the perfect teacher or instructor in Broadway for private bass guitar lessons in your home or in their studio. Check out some of our most popular teachers near Broadway including Bellevue, Tacoma, Snohomish, Kirkland and Kent. Bass is my primary instrument - I love playing bass! I also love to teach it. As a bassist, my primary concern is with your technique. I will show you proven strategies to help you play with power, control, and minimal effort. These principals set the foundations from which all world-class players are built. Every single lesson is designed just for you. We focus on your goals while having fun playing music together. We talk about good practice habits and how to achieve new heights with your abilities. You learn to play songs that you recognize as well as improvising basslines of your own. Bass is a fabulous instrument because it has the biggest influence on harmony. We will see exactly WHY the bass controls the music and HOW to get the results your ear is searching for. By helping you understand the fundamental principles of music we can take the guess work out of your playing, enabling you to make solid choices with consistent results. Come learn about the different kinds of bass playing.. two-feel, walking, bossa and more! Bass is essential to my passions and understandings of music as it was (along with guitar) my first instrument, and I studied electric bass performance in Boston. I've been a musician all of my life. I have a music education degree and have performed in professional ensembles. I've played bass guitar in a funk rock band, covering many Red Hot Chili Peppers songs, as well as others from the 90's. 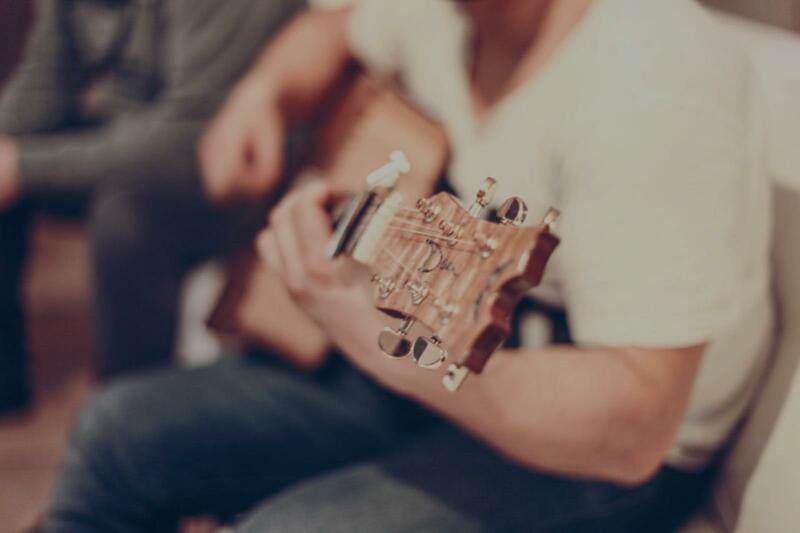 I currently focus my energy on the acoustic guitar, however I feel very comfortable playing and teaching introductory and intermediate skills on the bass, including techniques in finger picking and slap bass techniques. Curriculum will include technique, styles discussion, songs, and performance. e musical theory make sense. Will definitely return for extensive lessons." "Patient and clear directions to accommodate learning disability. Courteous, encouraging." re thing. Alex is obviously extremely passionate about teaching and music. Alex goes above the expected level of effort from a teacher, making sure every lesson has new and interesting material to be covered, as well as staying in contact as needed outside of lessons to answer any questions that may arise while practicing. If you are looking for someone who is dedicated to your learning process, as well as doing everything they can to keep material interesting and fun, I would suggest Alex." f because the energy is going towards what you already feel you need to work on and not just moving on to the next lesson. The tailored lessons make for a low pressure learning environment to fit your needs. As long as your consistant with receiving his lessons you will get where you want to be with your talents and be jammin out soon." allenges them but does overwhelm them; they strive to do their best for him!" ed up what I knew and had me working on exercises and a great bass line that got me playing right away. He has been very flexible and accommodating of my schedule needs, and he gives plenty of positive and constructive feedback. I've been working in education for nearly 30 years, and I know a great teacher when I see one. David fits the bill, and I'm lucky to be working with him." eed a lot of work ;) ) and even my dog loved him! Very excited to continue to work with him and become a bass master!"